A nation-wide bank strike in India hit the public transactions like cheque clearances and cash deposits, but the vital treasury operations including a 150 billion rupee ($2.24 billion) government bond auction are unlikely to be affected, traders said.Staffing in treasuries of banks are likely to be less than normal days but officials will ensure that functions like bidding at the auction will run smoothly, three traders at state-run banks said. “Treasury people have been allowed to enter the head office of the bank, so there is no problem for us in trading or bidding at the auctions,” said a senior trader at a large state-run bank. However, there could be some issues in some banks settling the previous day’s trades due to thin staffing. “Settlement will be a problem at back office,” said a senior official with State Bank of India.The RBI was also not too worried about the impact of the strike on treasury operations and settlements of banks. “There shouldn’t be any problem. Primary dealers are also there to underwrite if needed. But auctions should go through smoothly,” the official said. An estimated 1 million bank staff are expected to strike work, opposing the government’s proposal to merge SBI‘s associate banks with itself. In addition, unions are against the government’s proposed move to privatise IDBI Bank. For a world so confident that central banks can solve almost all economic ills, the dramas unfolding in Greece and China are sobering. “Whatever it takes,” Mario Draghi‘s 2012 assertion about what the ECB would do to save the euro, best captures the all-powerful, self-aware central bank activism that’s cosseted world markets since the banking and credit collapse hit eight years ago. 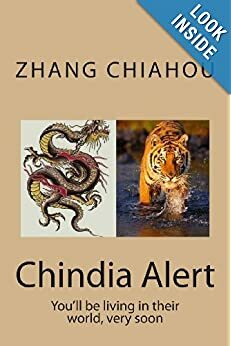 From the United States to Europe and Asia, financial markets have been cowed, then calmed and are now coddled by the limitless power of central banks to print new money to ward off systemic shocks and deflation. But even if you believe central banks will do whatever it takes – to save the euro, stop the recession, create jobs, boost inflation, prop up the stock market and so on – it doesn’t necessarily mean it will always work. And so the prospect of the European Central Bank potentially presiding over, some say precipitating, the first national exit from a supposedly unbreakable currency union will inspire a rethink of the limits of Draghi’s phrase for all central banks. Of course, the ECB does not want to push Greece out of the euro. But ‘whatever it takes’ may just not be enough to preserve the integrity of the 19-nation bloc if the ECB’s mandate prevents it from endlessly funneling emergency funding to insolvent Greek banks. And as long as the Greek government is at loggerheads with its creditors, the central bank can’t wave a magic wand of monetary support without breaking its own rules. The ECB continues to insist it will do all in its power to prevent contagion to other euro zone markets and there’s little doubt it will make good on that. But the problems stemming from a Greek exit are not of financial seepage but of political contagion to other euro electorates tiring of austerity. And that sort of contagion is beyond ECB control. via Greece and China expose limits of ‘whatever it takes’ | Reuters. Indian private banker K.V. Kamath has been named as the first head of a new development bank being set up by the BRICS group of emerging market economies, Finance Secretary Rajiv Mehrishi told reporters on Monday. The BRICS – Brazil, Russia, India, China and South Africa – agreed to set up the $100 billion development bank last July, in a step toward reshaping the Western-dominated international financial system. “Kamath has been appointed as the head of the BRICS bank, the appointment will become effective when he becomes free from his current assignments,” Mehrishi told reporters in New Delhi. It was agreed then that the New Development Bank, which will fund infrastructure projects in developing nations, would be based in Shanghai. It would be headed by an Indian for a first five-year term, followed by a Brazilian and then a Russian. via Private banker KV Kamath named first BRICS bank head | Reuters. Firozaben, a nurse at an upscale clinic here, opened an account at the state-owned Bank of Baroda Ltd. in December, attracted by the promise of an overdraft provision and accident- and life-insurance policies—all for no fee, courtesy of a government program to bring India’s masses into the banking system. The same month, Mohammad Assalam Ansari, a tailor, traveled to an account-opening “boot camp” run by the bank. He says he had to pay 100 rupees before a clerk would give him an application form. Despite this, he says his application was rejected; he isn’t sure why. Their stories reflect both the promise and the weakness of an ambitious program by Prime Minister Narendra Modi to widen access to financial services to the country’s poor. The goal is to make India less cash dependent, shrink the black economy, reduce corruption and boost growth. via Demands for Bribes and Other Barriers Get in Way of Modi’s Banking Push for the Poor – India Real Time – WSJ. Savers seeking higher returns have been pouring money into online money-market funds offered by the e-commerce companies Alibaba Group (BABA) and Baidu (BIDU). One fund, Yu’E Bao, started last year by Alibaba affiliate Alipay, drew 535 billion yuan in its first 15 months of existence from 149 million customers, more than the populations of France and the U.K. combined. Users simply tapped a few buttons on their mobile phones to secure an annual rate of return that climbed as high as 6.8 percent before falling to about 4 percent recently. Savers can also earn more on their money by moving to high-yield products, the fastest-growing part of the so-called shadow banking system. Households put 12.9 trillion yuan into high-yield trust products as of Sept. 30. Trust companies pool investor capital to put money in real estate and construction projects, or make corporate loans, and promise returns of more than 10 percent. Trust companies have seen assets under management rise more than tenfold since the start of 2009. The Shanghai Composite Index’s 45 percent surge over the past six months has led people to shift money from banks to stocks. In the first week of December, Chinese investors opened almost 600,000 stock trading accounts, a 62 percent increase over the previous week, according to China Securities Depository & Clearing. To stimulate the economy, China’s central bank on Nov. 21 announced a cut in benchmark interest rates for the first time in more than two years. That was offset by the central bank’s decision to raise the maximum interest rate banks can pay customers to 20 percent over the benchmark from 10 percent above it. 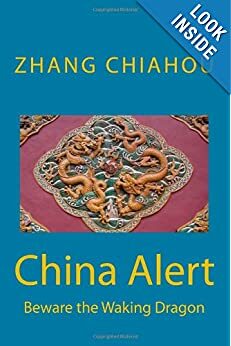 Ping An Bank (000001:CH), China Citic Bank (601998:CH), and Bank of Ningbo (002142:CH) immediately alerted customers through text messages that they would offer the highest rate allowed. via Chinese Banks Lure Deposits by Offering Goodies for Cash – Businessweek. India’s state-owned banks are conducting a massive campaign to open millions of accounts for the poor. The measure is aimed at some 150 million Indians who are off the financial grid and vulnerable to black market money lenders. Bank managers said Thursday that tens of thousands have already lined up to open accounts since Prime Minister Narendra Modi announced the campaign in his Independence Day speech on Aug. 15. The four-year program may also help beat back the endemic corruption affecting almost every level of Indian bureaucracy, by channeling government welfare and work payments directly into the accounts of individuals rather than through regional and local offices. As an incentive the federal government is providing 100,000 rupees ($1,650) in life insurance to every account holder. 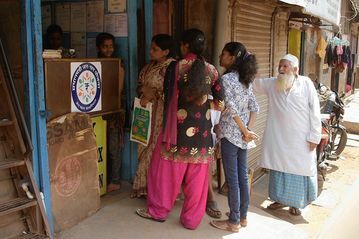 via India urges millions of poor to open bank accounts – Businessweek. “There’s never been a corporate bond default, [so] investors have been conditioned that there is no such thing as risk in China,” Leland Miller, president of research firm China Beige Book, told the BBC. 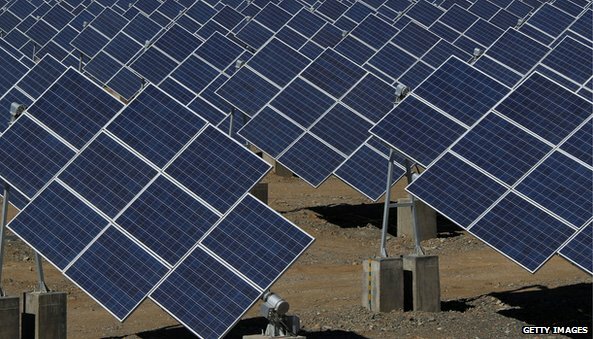 via BBC News – Chaori Solar in landmark Chinese bond default.